In 1959 George Attwood built a block of three shops next door to the old Post Office in Kiwi Road (now Rangatira Road). He then leased me a small back room for £2-5s per week in which I operated my first barber shop. As I was pretty hard up financially I purchased an old barber’s chair for £20 and made a counter and unit fittings. An old settee was brought from home and it was 12 months before I could afford lino on the floor. Beach Haven was as yet a new housing area and some said I wouldn’t survive out there "amongst the strawberries", but they were proven wrong and thirteen years later I sold a viable business! My weekly earnings initially were not as high as my town job and with house repayments, shop rent, two insurance and electricity bills, things were tough and by then Pat was expecting our first child. The day we brought the baby home from hospital I fell off a scooter bike and broke my collar bone. This put paid to the shop for five weeks as I was not covered by Accident Insurance. To help with the finances I cut hair at the Hobsonville Air Base for two days per week and worked back in my shop for the other three days. When Wally Archer opened the Ranch House in Birkdale I was employed as one of the waiters in the restaurant, a position I held for 18 months. 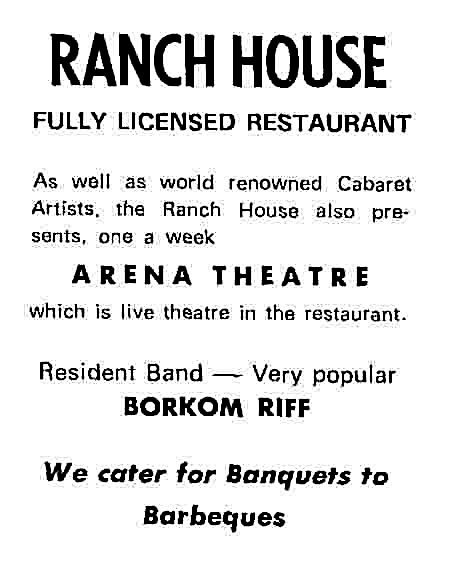 The Ranch House was then a non-licensed dine and dance restaurant. Cityside clients in those days came across the Harbour by vehicular ferry and were required, quite illegally, to bring their own refreshments. How primitive it was to see people arriving with cartons of beer or parcels of wine and place them under the tables. Every now and then the Police raided the place and our job was to whip the glasses off the tables and replace them with clean ones. Even though the Police were aware of how the system worked, they had to go through the formalities of questioning patrons as to what they were drinking. Had they bothered to look under the tables they would have known. All stewards were versed not to admit who was in charge. One policeman asked me who was in charge and I replied "There was no one in charge". He then asked "Who would be responsible should any trouble break out on the premises?" "Not me", I replied, "I’m the smallest joker here." Saturday nights from 6pm to 1am on Sundays earned me £3. The first night at the Ranch House I shall never forget. I was assigned to setting out 140 glasses on the tables and this was easy. Then the headwaiter placed three drawers of cutlery on a table and requested I set the tables whilst he helped with the candles. Crafty me, couldn’t go wrong by placing one knife and one fork in their correct order, but boy was I sweating as I had forgotten the correct setting order for the rest. I called on another waiter to give me a hand as I was running late. He promptly obliged and when I quickly summed up the system I thanked him and allowed him to carry on with his other duties. After working all week at the shop and Saturday night at the Ranch House, I found finances were still stretched and was forces to work Sundays for Neville Jenkins picking strawberries for 6d per chip. A North Shore land agent approached me during this period and had me signing up properties for him on Saturdays. I can’t say I enjoyed this very much as he often told me not to tell "so and so" we were dealing with "Mr. X". Things came to a head when he informed me he had a land agent working for him – the one who ran off with our house deposit! During the first twelve months in business we couldn’t afford to eat meat regularly but in later years when we could easily afford it we chose not to. Gus Henshaw, a local butcher was very kind to us by giving us one pound of sausages per week which we diced into our vegetables to make one good meal. The Ranch House burnt down in the mid-80’s. I also ran a dry-cleaning agency in conjunction with my business. One day a local grocer came in to exchange a dirty pair of trousers he was wearing for his clean ones on the rack. As I had no back room he requested to change in my open shop. Just as he dropped his trousers I thumped on the wall and yelled out to Joyce Chapman who ran a Ladies Hairdressing Salon next door. Joyce came running in not knowing what to expect, just in time to see this poor joker in the last stages of zipping up his trousers in record time. After two years in business things started to improve and I then relinquished my part-time jobs. With the growth of population in the district I removed a wall and expanded my business to embrace the empty shop next door. 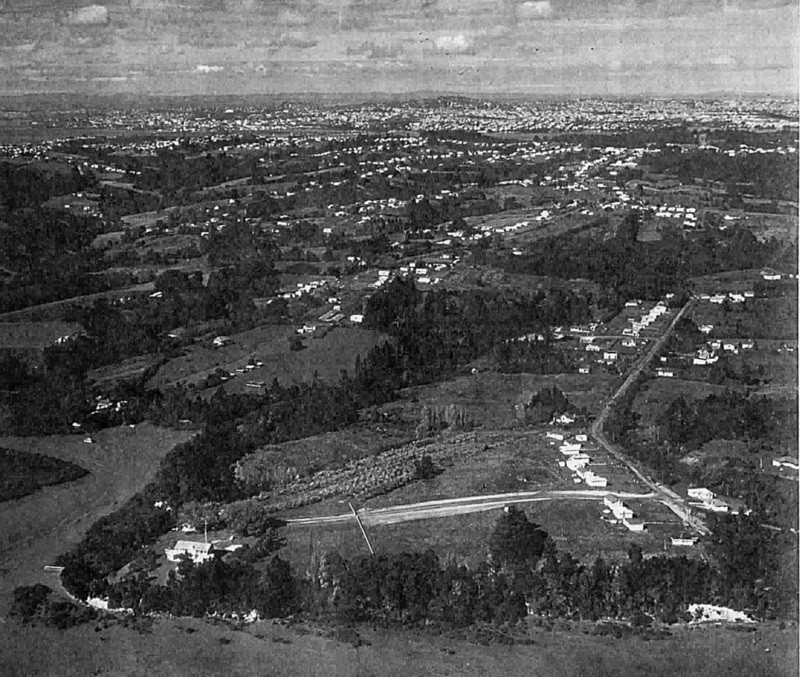 Aerial view of Birkdale with the Ranch House at the bottom left. Lancaster Road runs up the right of the picture. 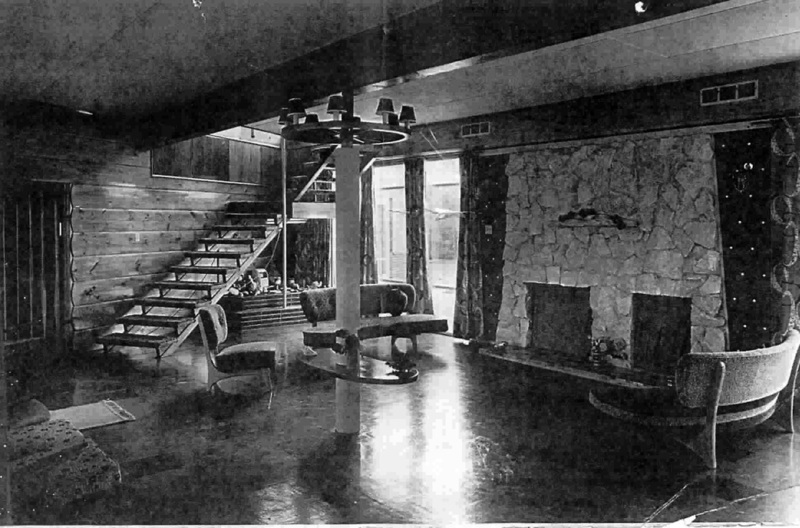 Our last Newsletter, contained several pictures of the Ranch House and included the reminiscences of Percy Allison when he was working there. Since then, Percy has obtained from Barbara Doyle, current owner of the Brian Boru Hotels, further information on the history of the Ranch House. Extracts from a letter from Barbara Doyle to Percy, are printed below. 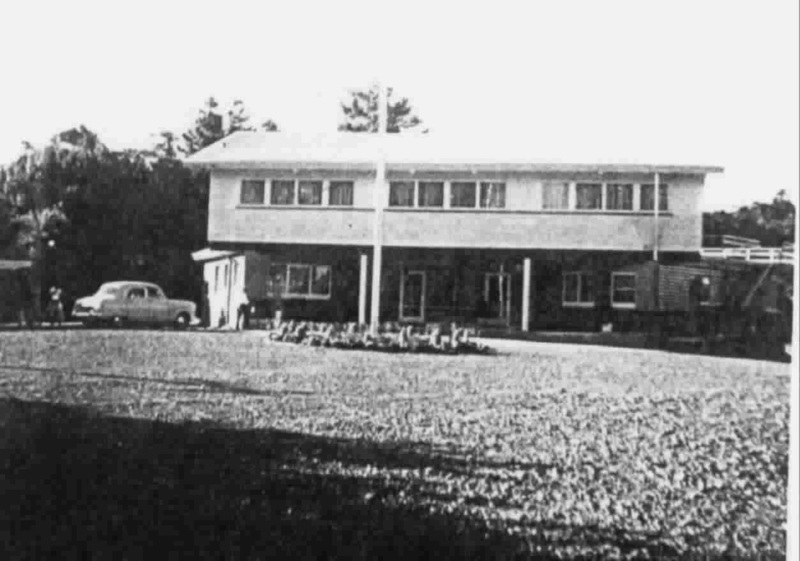 The Ranch House was originally built by Wally Archer and used by Dr.Jensen as a health clinic before he turned it into a dine and dance. This was in the era of the Back of the Moon, Kenly Road House, The High Diddle Griddly in K.Rd and La Boheme in Wellesley Street. The Dutch Kiwi, Titirangi, The Colony and The Toby Jug all came slightly after. The Ranch House was one of the first in that era of bring your own booze (in crates and cartons and whatever you could) and there were many artists discovered in those days. The Brodie Brothers started their career as a group at the Ranch House. It was built out of the left-overs of all Wally Archers construction jobs. Mr. & Mrs. Robinson bought it from him. Mr Robinson was an ex-army person and died of a heart attack. Then Smiths bought it from Mrs. Robinson and they had it for 18 months. They sold to Don and Pat Wade who were there for 3 years and ran it on Saturday nights as a dine and dance and then had private parties through the week. It was always a great place for weddings and all owners of the Ranch House put on weddings. It was especially beautiful in about October when the 36 pear trees in and around the grounds were in bloom. I bought it from Pat and Don in November 1969. It was then a licenced restaurant with catering capacity for 80 people. I had no sooner got there when I decided it was too small as I had had to turn down a least 4 weddings for 300 people. So I called a builder in and asked him to extend it to seat 300. No sooner had I done this when Elaine Hegan (an entertainment agent) came along and asked it she could put the Platters in there. And so it became a cabaret over night. They played there for 6 weeks. That was the start of an era of entertainment in NZ never to be repeated. For the next nine years I imported 100 acts and employed almost every NZ entertainer and musician. In 1973 the Licencing Commission revoked my licence because I was putting on entertainment in a licenced restaurant. As a result of that, I went to the Statutes Revision Committee and requested a cabaret licence be legislated. After two more trips back to Wellington they did in fact legislate a cabaret licence and so the Ranch House was responsible for changing the licencing laws. My marketing skills and the great entertainment that was available while I was there made the place very famous. In March of 1978, Ray Hoare and Peter Rixon came along and offered me $450,000 for it. I did not even stop to think whether I wanted to sell it or not. The sale took some 8 months to go through and I stayed on and ran it for Ray Hoare until March 1979. He then leased it to Rockie Cribb from Rotorua who in turn leased it to Don and Kevin Selwyn who borrowed money from Maori Affairs. They were in control (or lack of control) when it was raised to the ground very mysteriously in 1981. Sadly for me it became a mass of charred remains never to be rebuilt. Ray Hoare received $350,000 in insurance. The insurance company had a private detective on the job for two years hoping to prove arson but never did. I have seen the mass of houses there but know no more. During the 10 years that I was there, I employed over 1000 staff and had over a million customers, over a thousand weddings and over 100 overseas acts. I originally paid Don and Pat Wade $72,000 on $2,000 deposit and $28,000 worth of equity in properties.